Paleo, Gluten Free and Delicious! 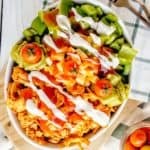 This Buffalo Chicken Grain Bowl is the perfect meal to compliment your training program! Mix 1/4 cup yogurt and 1 teaspoon of hot sauce in a medium bowl. Add shredded chicken and mix until coated. Set aside. Mash avocado with garlic and salt. In a small bowl, mix the 1/4 cup yogurt with remaining 1/2 teaspoon Buffalo hot sauce. Take 4 serving dishes, layer each with equal portions of romaine lettuce, 1/2 cup brown rice, 3 oz shredded chicken, and 2 tablespoons of mashed avocado. Garnish with 1/4 cup cherry tomatoes and a drizzle of yogurt glaze. Many ancient grains work well in this recipe. I've tried couscous, bulgur and kamut. Keep it gluten free by using a gluten free grain, like brown rice or quinoa.